This adorable Rabbit comforter is a security blanket and is soft and inviting for young babies to cuddle. 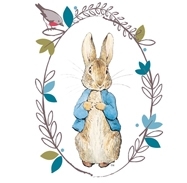 The sweet rabbit face features safe embroidered detailing making it suitable from birth and is styled in neutral cream and brown hues. The perfect present for either baby boy or girl. The rabbit measures 34cm x 34cm.